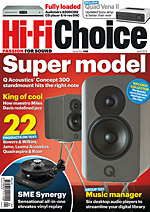 Hi-Fi Choice magazine has been at the forefront of audio equipment reviews and advice since 1975. Our philosophy is based around in-depth reviews by some of the UK's leading audio journalists. Central to this is our Blind Listening Group Test where panels of industry members listen to products without any knowledge of the brand or model on test for truly impartial thoughts.